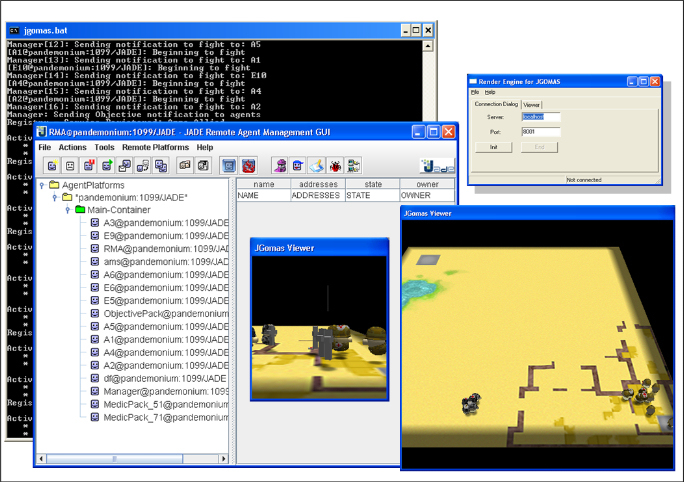 Specifically, JGOMAS allows to run agents in different teams, which compete to achieve their own and team objectives. Those two teams compete in a capture-the-flag-likegame, where one team defend its flag against the other team, which tries to capture it. The agents can play different roles: soldier, medic and field operations. Moreover, agents need to cooperate with their team-mates in order to achieve their objectives. For example, a medic can deliver medic packs to a soldier mate with a low level of health who sent a "call for medic" request. 23/01/07 Version 0.1.4: Wall detection enhanced.